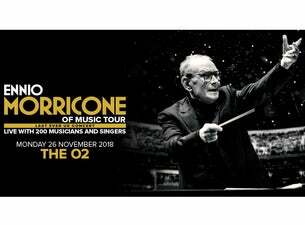 Ennio Morricone is to perform his last ever UK concert. The Oscar and Grammy Award winner will conduct a 100-piece orchestra with soloists plus a choir of 75 voices this November at London's O2. Morricone is rightly considered the world’s greatest living film composer, a legend whose work has reached far beyond the scorched desert-scapes of Almeria (A Few Dollars More) and the tumultuous waters of Iguazu Falls (The Mission). Much sought after by filmmakers the world over for his matchless versatility and productivity, Morricone’s innovative soundworks and truly exhaustive range of musical styles have complemented practically every conceivable movie genre there is. Over a career spanning six decades, Ennio Morricone has composed over 500 scores for cinema and television as well as over 100 absolute music works. Highlights include his scores for Once Upon a Time in the West, One Upon a Time in America, A Fistful of Dollars, The Untouchables and The Mission. Morricone’s score for The Good, The Bad and The Ugly holds the number two position in the Top 200 ranking of best film soundtracks ever composed. That same year, Morricone also reunited with director Giuseppe Tornatore on romantic drama The Correspondence, starring Jeremy Irons. Its release was exactly 30 years after the 1986 release of The Mission, which also starred Irons. Morricone and Tornatore had previously collaborated on Cinema Paradiso, Malèna, The Legend of 1900, Baaria and The Best Offer. The performance in London is part of an extended tour to mark his 60-year anniversary as a professional composer and conductor, which has included more than 40 concerts played in 30 European cities over the last few years, selling over 500,000 tickets.